Please choose FedEx as the shipping option for all tub trim orders. 2" Stainless steel strainer w/rubber stopper. Fits drains from 1-1/2" to 2". Includes 15" metal chain and ring. 1-1/2" ABS. Metal strainer and overflow plate. 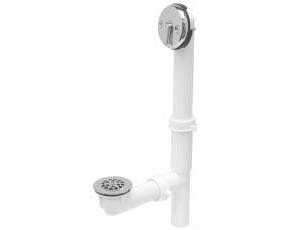 Holds tub or shower pans against wall while allowing environmental expansion and contractions without cracking the tub or shower pan. 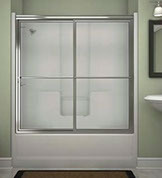 Stainless steel to prevent rusting or discoloration while providing a strong "spring" action. 60" Kit includes: One 60" retainer, four 48" retainers, one 60" molding, three 48" moldings, 2 inside corners and 2 outside corners. 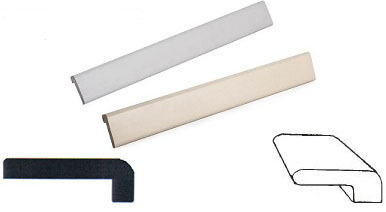 54" Kit includes: Two 54" retainers, two 54" moldings,2 inside corners and 2 outside corners. 54" set includes (2) 28" and (1) 53 1/2" length coves, one left end cap; one right end cap; two corner caps. 60" set includes (2) 48-5/8" and (1) 59-1/4" and (2) 23-5/8" length coves. Ends and corners. Please order a min of 3 pieces of Tub Molding per order. Two 6' 3/4" cove lengths of polished aluminum. 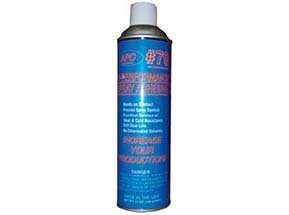 Comes with everything for most demanding repairs to all types of plastics, fiberglass and even enamel bath fixtures. 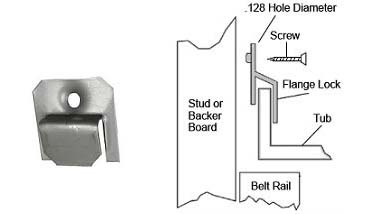 Shower stall cracks can be repaired in minutes.